Trying to clean up your diet and eat healthier this year but having a hard time loving the new healthy foods you should be eating? I’m the same way: there are so many bad foods I love and so many good ones I feel like I’m forcing myself to eat. The good news: in EatingWell Magazine, Holly Pevzner reports on new research that shows and curb your taste for those foods you may regret getting chummy with. 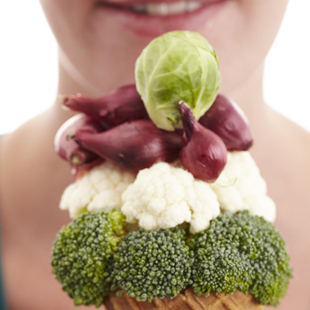 The secret to learning to love healthier foods lies in using all five senses. “A food’s texture, how it sounds, how appetizing it looks, and how it smells all play a role in flavor perception,” says Barb Stuckey, author of the recently released Taste What You’re Missing: The Passionate Eater’s Guide to Why Good Food Tastes Good. Here are 5 ways you can use all your senses to learn to love healthier foods. It may not be the taste of Brussels sprouts, cauliflower or broccoli you hate, but the smell. Cooking cruciferous vegetables releases sulfurous compounds (the same compounds that deliver cancer-fighting benefits). Try steaming them or roasting them, which releases the smelliest compounds, and then eat them in another room from the kitchen. When it comes to foods you love, strong complementary aromas (like a whiff of coffee in a mocha dessert, vanilla beans in sugar) help you take smaller bites, a natural response so you are not overwhelmed with flavor. Try lighting a vanilla-scented candle at dessert. “Even though vanilla actually has no taste at all—it’s only a smell—we are unable to separate which information came from our mouth and which from our nose,” says Juyun Lim, Ph.D., a professor of food science at Oregon State University. Moms and dads, here’s the secret to getting your kids to learn to love veggies: it’s actually OK to add a tiny bit of sugar. Researchers found that after three days of eating broccoli and cauliflower dipped in a mixture of water and 20% sugar, people’s tastes even for the unsweetened vegetables improved. Think of it as flavor training wheels and try these 5 other ways to get your kids to eat everything. If you already have a sweet tooth, you can use a similar strategy by cutting back on all sweet foods, especially those with artificial sweeteners. Often those artificial sugars are many times sweeter than regular sugar and stimulate the reward area of your brain, causing you to, in turn, crave even more sweets. “If you gradually cut artificial sweeteners from your diet, you will lose your taste for them,” says Yale University’s Dr. David Katz. You can also learn how to retrain your taste buds. And if it’s heart-clogging sodium you crave (heaven knows, salty foods are my bad boys! ), try a splash of vinegar—which the pores in our tongue react to in the same way they do to salt. It won’t taste exactly the same, but your tongue will get a similar sensation to what it gets with salty foods. Your heart will thank you. The more contrast on your plate, the more pleasing the perception is and the less you eat, shows a recent study in the Journal of Consumer Research. One way to do this is make sure you get a variety of colors on your plate. In the study, people who ate white pasta Alfredo on a red plate ate 22 percent more than those who were served the same amount on a white plate. Another good rule of thumb to make sure you get the nutrients from various fruits and vegetables that you need: make sure you have these 7 colors of food at every meal. The more texture or viscosity a food has, the more its taste will linger in your mouth. Think about how a sip of a smoothie coats your tongue long after a soda has been guzzled down. Or how adding nuts or seeds to a salad—things that require more chewing—draws out the meal. How to Cook 20 Vegetables and Make Them Delicious!